Companies like ecomaine used to get paid to export recyclable materials to China. Now, recycling companies and municipalities have to pay to send the same materials out. PORTLAND/YARMOUTH (NEWS CENTER Maine) -- Most of the paper, plastic, metal, and glass we recycle eventually goes to China, the largest importer of recyclable materials in the world. However, the country has recently imposed new regulations banning the importation of many plastics and paper materials and it’s created a collapse in the recycling market. 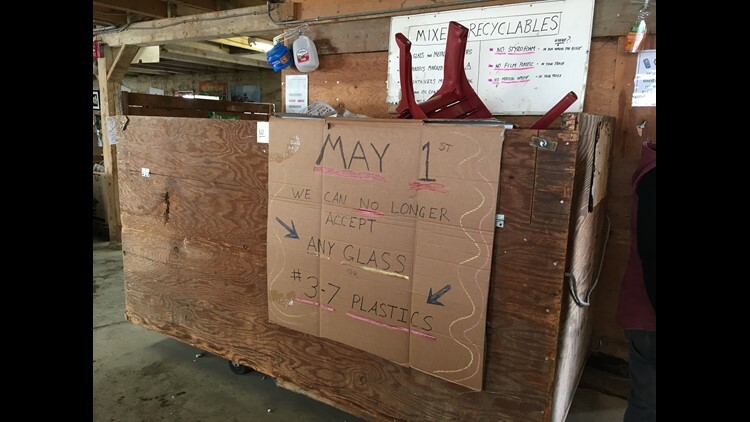 This time last year, recycling facilities like ecomaine were getting paid to send out material. Now it’s paying to send out the same stuff. So what does this mean for us? Those added costs could eventually be passed down to us next time we want to get rid of an empty milk jug or stack of magazines. A flip-flop, garden hose, and suitcase. A few of the non-recyclable items that ended up in a massive recycling bin at ecomaine. Kevin Roche is the CEO. He says paying closer attention to the items we are recycling could remedy a problem that’s not only an issue in Maine right now but across the world: a glut in the recycling market. China is cracking down on contamination. Meaning, if there’s any trace of non-recyclables in the recyclables, the country won’t take it. For example: a bag of trash in the ecomaine recycle pile. Maybe it was a mistake, but it’s trash that staff must pull from the pile. In fact, ecomaine has quadrupled its staffing of the sorting lines in the past few weeks to try and eliminate as much contamination as possible. Another contributing factor to the collapse is one that Roche says we can’t do much about: Newspaper. It used to go through Portland’s ecomaine facility before it was exported to China but now, Roche says people are going digital. Instead it’s sold as a “mixed paper” which is less valuable. Markets don’t want it. So now it’s piling up at ecomaine, with no place to go. “Cereal boxes, junk mail, all that kind of stuff,” explains Victor Horton. Horton is from the Maine Resource Recovery Association, a trade group that works with towns and businesses, moving recyclable goods to market in the U.S. and Canada. He says last year the association was selling that mixed paper for $40 or $50 per ton for the towns. Instead of getting paid to get rid of it municipalities are paying to get rid of it. Like in Bowdoinham, where this recycling facility stopped collecting glass and certain plastics. While there’s nothing we can really do about that, we can reduce and reuse. Curtis Dimock is the Superintendent of Transfer and Recycling for Yarmouth. The Yarmouth Recycling Center is a place to recycle practically anything, like power tools, mercury thermostats, cell phones and cameras. Or books and eye glasses, items we can reuse right away. According to ecomaine, recycling costs will be passed on to the communities and haulers it works with. Any load with greater than 5% contamination will be charged an extra $40 per ton. Any load with 10% or greater contamination will be charged at extra $70.50 per ton. Still wondering if something is recyclable or not? There’s a free app that can give you an answer instantly. It's called the ecomaine recyclopedia.